LL: Thanks for taking the time to answer our questions as I think you’ve taken the spotlight quite a bit lately and probably have a lot on your plate! SIMON: Yes, no problem at all! There has been quite a lot to take care of the past couple of weeks, but the season is slowly coming to an end, so I’m getting ready to calm down a little. I’m already looking forward to getting back out there next year to try my best! LL: Everybody will talk about what you did last October for a good, long time. Two world records in a row! Congratulations! You threw an Innova Blizzard Boss, a disc gifted to you by Avery Jenkins, 863.5 feet (263.2 metres) to beat David Wiggins Jr.
1. How much of this — seemingly impossible distance to most of us — is due to the terrain? The wind? The lightweight blizzard discs? The 360° throw? What everybody wants to know is… what’s the trick?! 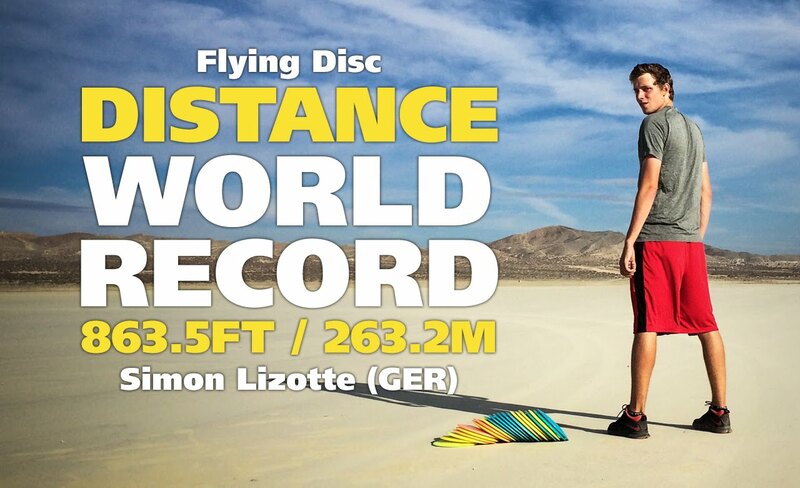 We obviously use lighter discs in the desert because of the wind (more carry). With good winds, I can probably reach 750 feet on a field, so the higher altitude on the lakebed added about 100 feet. Looking at these stats, I guess the wind adds a good 100 feet and the “desert conditions” add another 100. So, I guess you could say that throwing in the desert with high winds will add 25 percent to your distance. What many people don’t realize is that, you have to throw the disc really high and hard for the wind and altitude to actually really help. I think players who throw around 400 feet will not see any major differences if they try to throw out there. Also, it’s not like we’re throwing in a hurricane. The optimal wind is around 15-20 mph which is not “crazy” wind. 2. So, let’s just say you are throwing with no wind at all, with what type of disc and what type of shot you think you would get the best distance? SIMON: When going for long distance it will always be the same throw: High turnover shot. [Editor’s note: Turnover refers to a shot where the disc is intentionally released on a flat or hyzer angle essentially to “flip” to the opposite anhyzer angle and “turn” on an atypical direction before finishing its flight.] I would probably use a blizzard Boss. It’s important that the disc has a “dome,” meaning it shouldn’t be flat. The more dome it has, the longer it will stay in the sky. I think I can throw nearly 700ft in calm conditions. 3. And 500+ feet with a mini? I don’t know what to say to this. I’m speechless! So I’ll ask this… No video of that shot? What happened? SIMON: Yes, I’ve read a lot of discussions about this one. Here’s what happened: First of all, I was the only person really updating online on what’s going on. All I had was my phone. David Wiggins and I threw some warm-up shots with the minis and noticed that we had a chance to beat the previous record. Wiggins threw first and crushed one to 450 feet. I was watching that and couldn’t believe how far that thing went. I was filming that shot and put in online. After watching that, I didn’t even believe that I had a chance to beat that so I only threw to see how far I can get it. My first throw came out of my hand with such speed and I got the angle just perfect. It was my best mini throw ever and since. I threw it 527.8 feet. Nobody, including myself, could really believe what just happened. The mini went so far, we couldn’t even see it with our eyes. A video would have just caused more of “We can’t even see the disc…” discussions. LL: You returned to Quebec to co-host the Deep in the Game clinic and I’ve read about how you’ve seen disc golf grow in Quebec from literally no courses on your last visit five years ago to more than a dozen active courses today. A few more are being developed right now, as I write this. Most of us disc golf players in Quebec, at least the ones that follow the sport, have a special bond with you and what you’ve been doing, especially this last year. Maybe it’s your name that sounds so “Quebecois” to us. Or maybe it’s the fact that you are quite young and already so very good. Or maybe it’s because we’ve heard such great stories, with pictures even, from your dad, David, and your uncle, Peter — two great, well-known disc golf figures here. They recount stories of you throwing discs for the first time as a toddler right here in Quebec and now, not two decades later, we are watching in awe as you launch plastic to such mind-blowing distances. 4. First, for those that couldn’t go to the DiscMania Deep in the Game clinic, something most of us want to know… Do you speak any French? 5. There’s a rumor around here that you could, really early on, throw further than say, your father and/or your uncle …and beat them on any given course. Is that story true? SIMON: I think the year I started beating my dad was in 2007. So, I was 14 years old. Possibly earlier.I just needed some time to grow, so I was physically able to throw farther. I remember the day I started throwing farther than my dad. Throwing far has been my “trademark” for a while now. I would love to play a round with Dave and Pete nowadays. Good old times!! LL: You obviously started taking disc golf seriously at a very young age, adding to this the fact that you have a very low PDGA membership number (#8332). That’s lower than your uncle Peter (#9189) and it’s also lower than most of the disc golf champions still active, if not for Ken Climo, Barry Schultz or your good friend Avery Jenkins. 6. It would seem that you became a PDGA member before top pros like Ricky Wysocki, Will Schusterick, Paul McBeth, Cale Leiviska, Nikko Locastro, Eric McCabe, even before Nate Doss and David Feldberg! When and how did that happen? SIMON: Okay, this happened because certain numbers were reserved for German players (European players). Don’t ask me how or why this happened because I don’t know. All of the German players that registered around 2004 have a number in the 8000s. I like the fact that my number is so low! But it’s not because I registered before all the other pros. If you check my profile the PDGA.com website you can see that my career starts in 2005. LL: For most people, throwing a frisbee seems to be easy enough. Throwing it on a very long distance with precision and consistency, that is another thing entirely. 7. You and Avery Jenkins gave a lot of clinics on the road this year, so what is the typical stuff you seem to be repeating over and over again to beginners? To advanced players? Is it very different? SIMON: Our main message to all the players is “keep it simple.” The simplest form can be the best and most effective. “Keep everything in one straight line and on one even level!” That’s probably what we say the most. Also “follow through” is a key point of our clinics. Follow through is so important because it takes all the tension out of your body and it also helps with consistency on hitting your line as well. The most common mistake I see is that players try to throw with their arm instead of throwing with their whole body. “The arm is a whip (slingshot).” Rotation in the upper body (shoulders) and driving your elbow are key points for throwing farther. 8. What is the best advice you’ve ever gotten, maybe one that changed your disc golf techniques or your game, and who gave it to you? SIMON: I’ve gotten a lot of great advice from amazing players over the years. This year one advice really stuck to my head. It was Paul Ulibarri saying: “If you do your best, if you give every single shot everything you’ve got, you will win.” When he said that I was like, “I knew that already.” But from that moment on, I focused on exactly that “do your best and forget the rest” mentality and went on to win the next two tournaments. Disc golf is a mind game and Paul McBeth is winning so much because his mind is the best. We all can throw a frisbee great. It’s about your head being on point. That’s what makes the difference between being good and great. Mind game! 9. How do you manage to keep it down, to smile, to look relaxed and ready again, within seconds of say, a very bad series of shots like a double bogey on a final round? Or after David Feldberg sank that impossible putt in Rochester Open, taking you to playoffs? SIMON: I’ve had some bad experiences with “freaking out” during rounds myself years back. One day, I decided to not do that anymore. Because everybody knows it doesn’t help. I want to be recognized as a player who smiles a lot, who has fun on the course and who can handle himself. I mean, we are throwing frisbees and we are getting paid for it. That’s freaking awesome. So there’s no real reason to get mad about anything. I don’t get bothered at all by other players being mad. They do what they need to do. If it would affect me, it would just be my weakness. What happened in Rochester was pretty crazy. He (Dave Feldberg) made that putt and in that second he won the tournament because I lost the will to win. My mind wasn’t set anymore to even try to beat him. I felt like I did my best and if that wasn’t good enough, I didn’t want to win. LL: We could go on forever, but most of us can and will read English and are able to get more info in other interviews on the web about you and what you do as a professional disc golf player, so I wanted to cover things a bit differently here. 10. One disc, only one to do it all, what is your choice? Mold, weight, plastic, color? LL: Thanks, Simon, for taking some of your time to answer us and to perform as well as you do. It reflects on the whole community of disc golf and it really helps grow the sport. Any final words, funny or not so funny story, sponsor plug you would like to leave us with? SIMON: I’m so glad to be out there and that people enjoy watching what I do. It makes it so much more fun and enjoyable. I will work harder on my game next year. I have made the decision to be more professional next season and take it to the next level. The future of Disc Golf is very bright and I love the team I’m in. Discmania is my family and they treat me like a true star. I really hope to be back in Canada next year again! I’m a proud half Canadian! Thanks all you guys for the support. My pleasure to represent and answer any questions you’ve got. I’d like to thank Peter Lizotte, Isaac Olson and Marie-Eve Dubois for their help with this interview!